Len Kennedy introduced MP Neil Ellis. 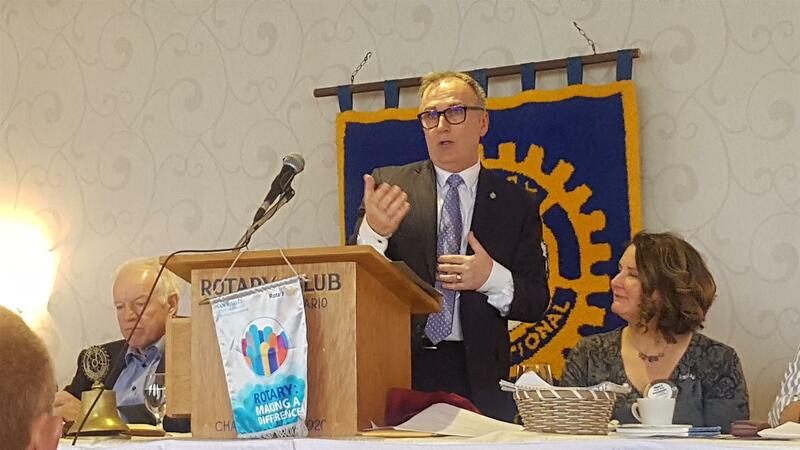 It is his great pleasure to introduce Neil Ellis, he is known for running a business for 33 years, Mayor of Belleville for two terms, and MP of the new riding of Bay of Quinte. Neil is also the chair of the Standing Committee on Veteran Affairs and in 2012 became Honorary Major of the Trenton regiment. Brings high caliber analysis. He studied Human Resources at McMaster and has a Bachelor of Arts from Carlton University. Neil is married to Susan, for over 30 years and they have three children. His daughter Madison is here with us today. Neil thanked the club for having him, feels like coming home. He was pleased with the opportunity to come and speak about Cannabis. He has discovered in his MP role, no one asked about his background. When you are Mayor you have staff to help you through things. When you are an MP you are on your own and start from scratch to run an office, manage staff and carry on with case work on topics like the child tax credit and veterans' concerns. He considers himself a Riding MP, representing the community within his riding. He gets big questions asked of party. He needs to be able to represent the party. Prime Minister has said to him over and over again, he wants to hear everything that is happening in the Riding, good and bad. What kept coming up was taxes so Neil spoke against taxes in a respectful manner. There are 338 members party wise, three different views. His background is risk management, when he looks at legalization it is coming. How is it today? Is it working? No. Would legalization help things? Yes. Cleaner source? Yes. Can youth buy it? Yes, it's probably easier than buying alcohol. Legalization would help prevent that. In Quinte region, number one industry is food business. Cannabis is coming. An edible business. Possible side effects to edibles -- feeling hungry, relaxed, sleepy, energetic. Even if we don’t want this or are against it, the industry and spin offs will grow. How can we make the best of it, look at businesses, look at medical research, look at extraction. We have the only college in Canada with this designation. This will be bigger than the wine industry. Look at this as Canada getting out in front. Whether it is in gummies or food supply chain, refrigeration, security cameras, product packaging. Get on board. Businessmen wanted licenses for this and came to Neil to help them out. It is a $30 million operation. Lots of veterans are suffering, he is on a committee. Last study was transition and suicide, listening to people who have attempted suicide. Hearing from spouses of people who have committed suicide due to serving with military, listening to them say that that Cannabis is helping. Why is it not prescribed more than it should be. Not OxyContin and other opioids. Need to figure out a profit on it. When you have a natural product, medical marijuana - will help with pain and stress. One has no TH content at all, but would help for pain. People who are out in front of it, are going to be the pioneers and on the edge of the business. His goal is to bring as many jobs locally and bring it to the College. Support and advice for workplace consumption? Handing down to the provinces to roll out. As an employer, it’s happening now. Every day he reads the paper and the sky is falling, this does not change. Is there going to be a change? Polling in this riding for Cannabis were 75% in favour. Outside polling done through outside the party, it was a regional poll. Need to make the best of it.